Published on August 17, 2010 12:35 am. Published on August 14, 2010 12:16 am. I visited this exhibition, by James Franco at the Clocktower Gallery, NYC, on July 15. Published on August 14, 2010 12:04 am. I visited Rivane Neuenschwander: A Day Like Any Other, at the New Museum in NYC. Published on August 13, 2010 10:59 pm. Entries close this Wednesday in SOYA for 2010. I’ve already spotted some amazing entries this year, so I’m excited to spend some time working through them with our producers. Published on August 10, 2010 9:52 pm. It’s a great initiative from Billy Blue, an annual opportunity to discuss the future of design, what we should be teaching tomorrow’s designers, and how we can bring art to business and business to art… I’m excited, but also a little terrified, as I am the last speaker of the day and it’s a 25 minute talk. Published on August 10, 2010 9:50 pm. Walkley Media Conference 2010: What’s the story? Are there any truly original ideas left in the world? Is originality over-rated? Or does true creativity lie in reinterpreting age-old ideas? With the way that technology and media are moving, when does a mash-up, remix or homage become plagiarism? What are the implications for copyright and intellectual property in a world where anyone and everyone can and will collaborate? The panel is chaired by Chris Warren, Federal Secretary of the Media Entertainment and Arts Alliance, and also includes Sophie Cunningham, editor of Meanjin, and journalist Malcolm Knox. I think my contribution will be to lower the tone and be a bit more pop-cultural… so I’m talking about I Can Haz Cheeseburger. Could be a disaster. Published on August 10, 2010 9:08 pm. 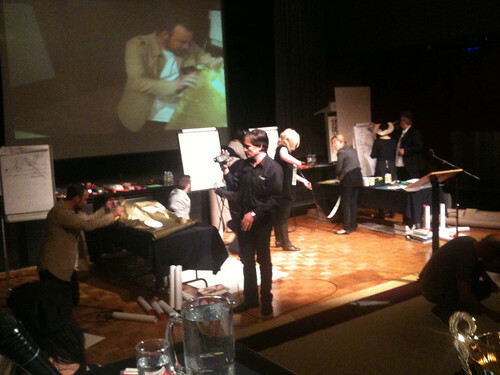 On Friday night I had a lot of fun as one of the judges of Iron Designer at the Powerhouse Museum, as part of Sydney Design 2010. Published on August 10, 2010 8:58 pm. I spent three weeks in Brooklyn/New York City in July [you can check out my trip on Flickr] meeting with great people, sitting in on talks, checking out arts and creative city-building projects, and generally having a very nice time. I’m hoping to invite some of the people I met to participate in Creative Sydney, and I interviewed others for the new SummerWinter. There’ll be more happening there later this year. Published on August 10, 2010 8:56 pm. Published on May 1, 2010 8:40 pm.